It feels appropriate to be making my debut on the Whippets blog shortly after my one year anniversary of being “recruited” to the team by Matt Wong. I’ll never forget receiving a Facebook message from him after the J.P. Morgan Corporate Challenge last June! I very quickly realized that I was in good company as one of many Whippets who joined the team because of Matt’s efforts, but little did I know that joining the Whippets would be one of the best decisions I’ve made in all of my years living in New York. I moved to the city shortly after graduating college in 2014. Having played four years of D1 lacrosse, I was concerned with what my fitness regimen was going to look like with the unpredictability of my hours as a banking analyst. Although I wasn’t prepared to commit to a city lacrosse team that had mandatory practices, I wanted to commit to something to keep me motivated, so I signed up for the NYC Marathon. Having never competed in track or cross country and never properly trained for a race in my life, marathon prep was a real struggle. I learned that sleepless nights spent in the office and eating meals at midnight are not the best ingredients for successful long runs. Admittedly, I also didn’t have the self-discipline or the benefit of camaraderie to get through the long runs without several rest stops. Needless to say, I showed up at the starting line with minimal training under my belt and a simple goal in mind: finish the race. I crossed the tape beaming with pride and writhing in pain with what I would later discover was a stress fracture in my left foot. This put my long distance running on pause. For ~2.5 years. Between November 2014 and January 2017, I felt pretty directionless in my fitness endeavors. I tried my hand at Crossfit for the better part of a year, and while I loved setting goals and dramatically improving my strength, it had its downfalls. I had a hard time stomaching the cost of belonging to a Crossfit gym; for a fresh post-grad, it felt a bit out of my means. Furthermore, the soreness I experienced after a hard workout would completely prohibit my body from running for days at a time, which was more frustrating than anything. While I’m sure my body cherished the change of pace from running nearly every day, I reached a point at which I needed it back. I’ve always loved running – it was inherently a part of my high school and collegiate sports, but more importantly it was and continues to be my outlet. Fast forward to January 2017, I had terminated my Crossfit membership and set a resolution for the New Year to get involved with a service organization in the city. After a healthy amount of research and consideration, I chose Achilles, thinking it would be a perfect transition back into more consistent running. And it was! I developed relationships with athletes and fellow volunteers through runs in the Park and found myself inspired and rejuvenated. By June 2017, I had signed up for my second shot at the NYC Marathon with two goals (1) surpassing the minimum fundraising requirement for Achilles and (2) qualifying for Boston. To bring it full circle, this coincided nicely with Matt Wong’s invitation to check out the Whippets. Frankly, the thought of joining a running team scared me. While I am no longer burning the midnight oil in my current job, I still cannot regularly attend evening practices, as my travel schedule and workloads are somewhat unpredictable during the week. However, I learned that I didn’t need to make it to every Meetup to find a home on the team. Saturday morning long runs proved to be the most fruitful for developing relationships, simply because of the amount of time on foot. 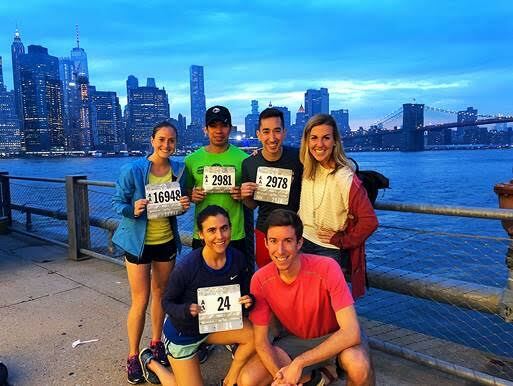 I slowly connected with teammates and found some training buddies who were willing to include me in early runs in the Park, on the East River path, or on the West Side Highway. All I had to do was say yes and not be afraid of failing to maintain their paces. My 2017 marathon training certainly wasn’t perfect, but it was significantly better than my 2014 attempt. I can fully attribute the 31 minute PR to the fact that I had teammates to run with – I didn’t feel alone. While I desperately wanted to be running the weekly mileage my early morning training partners were hitting, I knew I wasn’t ready. My body needed rest days, and my legs were not prepared to handle 70-mile weeks, let alone 50- or 60-mile weeks (to this day, I’ve still never run more than 50!). I liked changing up my routine with weekly cross-training sessions to complement the running. More often than not, I skip designated easy run days in my training plans, replacing those runs with classes at Tone House, Fhitting Room, Barry’s, etc. My absolute favorite cross-training in the city is Tone House. The classes remind me of the agilities and conditioning sessions my college lacrosse team was coached through during the season – grueling repetitions of speed work drills and strength exercises to fatigue the muscles quickly. I’m a particularly big fan of Tone House for this reason, the nostalgia, and I find it a great way to reduce impact on my legs, which I still am not convinced are ready to tolerate high mileage training plans. Maybe someday! As a part of my enjoyment of cross-training, I decided to sign up for a competition called the D10, formerly known as the Wall Street decathlon. It’s a bit of a misnomer, as it’s not a traditional decathlon – I would liken it to a miniature NFL combine, integrating speed, strength, and endurance events. Signing up for the D10 meant I was responsible for fundraising $3K for Memorial Sloan Kettering (an exciting challenge) and was given access to private training classes at several boutique fitness studios across the city (granted, most of the designated D10 classes were at 5am, which was a bit brutal!). 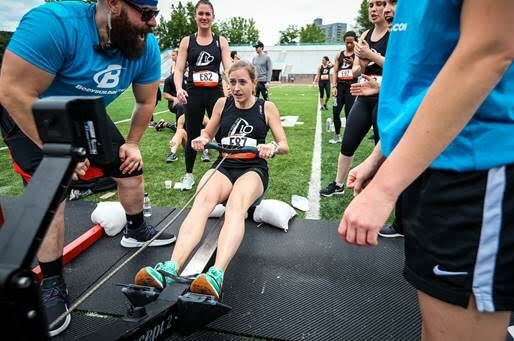 The ten events in order were: 400m run, football throw, pull-ups, 40yd dash, broad jump, 500m row, vertical jump, 20yd shuttle run, bench press, and 800m run. I loved training for the pull-ups, in particular, because it’s a very easy thing to incorporate into runs. Surprisingly, there are a few pull-up bars along the river paths on the east and west side for public use. Unsurprisingly, the two events I was most excited about heading into the competition were the 400m and 800m races. Prior to the D10, I had never owned track spikes or competed in a race on a proper track, so I was looking forward to testing the waters. The rookie jitters were SO real! I thought my heart was going to explode as I stepped up to the starting line for the 400m. At the end of the day, I was happy to have established a baseline for both of these events and to learn that I actually enjoyed the 800m. I’ve always said I’d try more short distance events, but I’m not sure when I would have mustered the courage to do so in the near-term if I hadn’t signed up for the D10. Now that I’ve ripped off the bandaid, I’m ready to try NYRR’s Tuesday Night Speed Series! 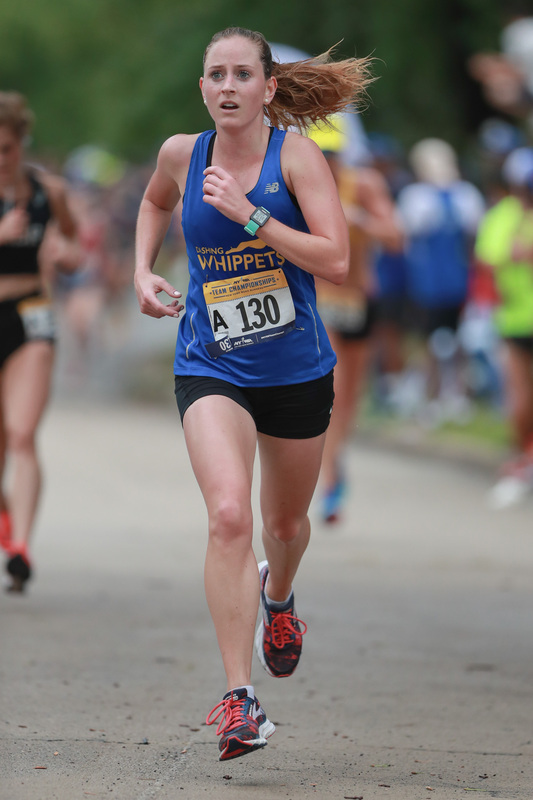 Like many of you, I was not a runner by trade before joining the Whippets. I’ve always been an athlete but not a runner. I’m still figuring out which distances I like, which races I want to focus on, what an ideal training plan looks like, how to incorporate strength training without compromising workouts, what my goals are, what I have to do differently to achieve those goals, etc. My path may seem disjointed or erratic to those of you who have been consistent runners for years, but for me, it’s been a really rewarding period of exploration. Surrounding myself with so many goal-oriented (and simultaneously fun!) runners, many of whom have years of experience and endless wisdom to share, has challenged me to think more critically, try new things, and most importantly, continue to do what I love.